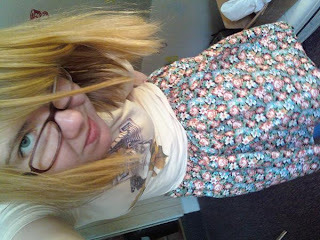 I finished my skirt for good. Hurray! I also almost-completed two orders all in one day. It was certainly at gratifying day for me. While I am here let me turn you on to some great artists. Some I know in person, some i happened upon. Let's call this entry the Art Issue. First off here is a girl near to my own heart. Her name is Eva and she is a dear, sweet girl. If you go through some of my older posts you can catch a picture or two of her. Number two here is Seth. I know Seth personally and think his work is just amazing. I really respect his talent and vision. He is a really cool guy with a lot of original thoughts in his head. Alexis Mackenzie is someone I actually don't know in person, but is one of my all time favorite artists. Here is an studio visit of her studio on fecalface.com, and here is her website. that's all for now, or that I can think of. I hope you like at least one of them.